In 1990, a beautifully decorated ossuary was discovered during a construction project in Jerusalem's Peace Forest which was located southwest of old Jerusalem and across the Hinnom Valley from Mt. Zion. Inside this ornate ossuary were found the bones of several children, an adult woman, and a 60 year old male. 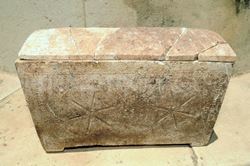 On the outside of the ossuary was found an Aramaic inscription that read in Hebrew "Yehosef bar Qafa" which in English was "Joseph son of Caiaphas." Is this ossuary of Caiaphas in the New Testament? Josephus refers to Caiaphas as "Joseph who was called Caiaphas of the high priesthood" (Ant.XVIII.95). The ossuary measures 37 centimeters high (14.6 inches) and 75 centimeters long (29.6 inches) and is currently is located in the Israel Museum in Jerusalem. While it is known as the Caiaphas Ossuary, as of 2014, there is still some controversy as to whether it is indeed that of Caiaphas of the New Testament; however, there is no evidence that disqualifies this possibility. The Caiaphas ossuary has been challenged for the lack of any mention of Caiaphas' status as High Priest and the caliber of the script. Stone masons usually incised the ossuary during the manufacturing process, and the script would typically be formal and deep in depth. The ossuary in question is somewhat cursive, informal and lightly incised which is often the case when inscribed after the ossuary has been made and possibly by surviving family members themselves. Countering these objections is the fact that the ossuary is without doubt from the 1st Century and covered with an ornate design worthy of an elite member of the priesthood. Of the dozen ossuaries found in this tomb, the Caiaphas ossuary was the most intricately carved (two circles with each containing five rosettes). The significance of this find is that it supports the historical existence of the biblical Caiaphas, who was the temple priest and who played a key role in Jesus' crucifixion. Another piece of evidence supporting for the historical existence of Caiaphas, is the Mariam Ossuary. This ossuary was discovered by grave robbers who plundered a Jewish tomb of the Second Temple period. In June 2011, it was acquired by the Antiquities Authority Unit for the Prevention of Antiquities Robbery. Because it was originally taken from its tomb location, archeologists could not evaluate the ossuary in its archeological context. To determine its authenticity, it was rigorously tested by Dr. Boaz Zissu of the Department of the Land of Israel Studies and Archaeology at Bar-Ilan University and Prof. Yuval Goren of the Department of Archaeology and Ancient Near Eastern Cultures at Tel Aviv University. Their research indicated that the ossuary came from a burial cave in the area of the Valley of Elah, and the inscriptions were found to be authentic. The ossuary was dated to the first century A.D. The 2,000-year-old ossuary had an Aramaic inscription formally and deeply inscribed saying "Mariam, the daughter of Yeshua, the son of Qaiyapha, priest of Ma'aziah from the House of Imri." Semitic scholars see the Aramaic "the son of Qaiapha" transliterated to the Greek as "the son of Kaiaphas." Thus Mariam was the granddaughter of priestly family Caiaphas; of which may have been the high priest Joseph Caiaphus. The reference to "Ma'aziah" harkens back to the time of King David when he enlisted the two chief priests (1 Chron 24:1-3) to help divide the priests and Levites into divisions to assist in the burden of worship services. "Ma'aziah" was the name of the priest in charge of the 24th division (1 Chron 24:18), and each division served about 2 weeks a year. The name "Imri" is historical and a reference to the sons of Immer who were a family of priests who first became notable during the first Temple period when the prophet Jeremiah was prophesying around the sixth century B.C. After the fall of Jerusalem and the Exile, the Bible mentions the sons of Immer as priest returning from the Exile (Ezra 2:3-37; Neh 7:39-42). Pashhur, the son of Immer, was the chief priest in the Temple who arrested and punished Jeremiah for prophesying the destruction of Jerusalem (Jer 19:14-15; 20:1-6). In the New Testament, Jesus would be persecuted by the High Priest Joseph Caiaphas of the line Ma'aziah descendant of the priestly sons of Immer. Because the ossuary places an emphasis on the priestly heritage of Mariam, many scholars believe Mariam is the granddaughter of the High Priest Joseph Caiaphas. 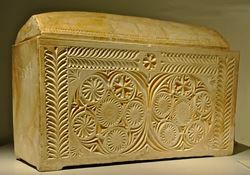 The significance of the Miriam Ossuary is that it corroborates what was previously learned from other ossuaries, rabbinic literature and the historian Josephus that the name Caiaphas belonged to a famous family of priests active during the first century when Jesus was put on trial by Jewish religious authorities. 1. Turnage M, "The Ossuary of Mariam, the granddaughter of Caiaphas, discovered", from the website: The Shard and the Scroll Blog, March 2013. 2. Rollston CA, "The Ossuary of Mariam Daughter of Yeshua’ in Context: Limning the Broad Tableau of the Epigraphic and Literary Data", from the website: Rollston Epigraphy, 2011.